How to watch AVI videos on iPhone/iPad? You probably have a few AVI files somewhere on your computer, either from the internet, digital cameras or shared from your friends. The trouble with AVI is that the iPhone iPad and most mobile devices could do nothing with it. Traditionally, if you want to watch AVI video on iPhone iPad, you need a conversion software to convert AVI to iPhone iPad compatible formats like MP4, MOV or M4V firstly so that iPhone iPad can read them. There are many iPhone iPad video converters that can convert AVI videos to iPhone iPad for both Mac and PC. If you search the internet for video converters to convert AVI to MP4 you will find so many of them that are free. But this is not only time consuming but also inefficient as you will end up having two copies of the same video, the original plus the iPhone version. 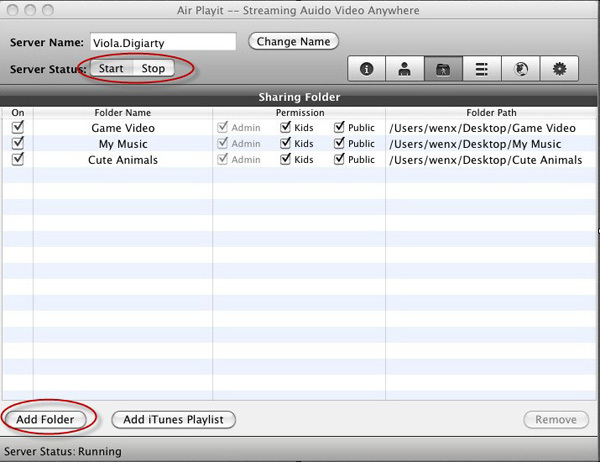 Here I will introduce you a more efficient way to watch AVI video on iPhone iPad by using Air Playit. Air Playit is a free video streaming software which is specialized in streaming videos audio from PC/Mac to iPhone, iPad, iPod touch without the third-party converting software and iTunes. It does the AVI to iPhone iPad conversion on the fly, while you can watch AVI video on iPhone iPad in real time. That means you don't have to wait until the file gets converted any more. Moreover, Air Playit can stream videos over local WiFi, remote WiFi, 3G and 4G, so that you can access your computer videos anywhere via internet, even hundreds of miles away. How to Watch AVI Video on iPhone iPad without Conversion. 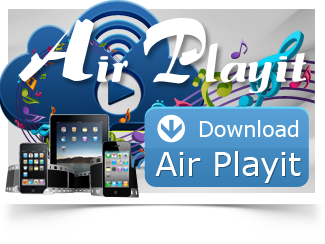 The preparation we should do is to download & install Air Playit server to PC or Mac, and Air Playit client on iPhone/iPad. Step one: Run the Air Playit server. Make sure the server is in Start condition. You can add your AVI video by clicking "Add Folder" so that you can stream the video to your iPhone iPad via Air Playit server. 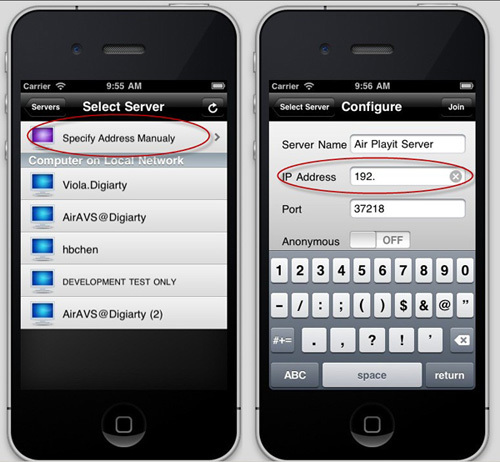 Step Two: Start up the Air Playit app on your iOS devices and add your server. If sometimes the client app can't find the Bonjour connection information, you need to specify the server address manually or close the firewall for a try. Step Three: Browse the folders under the server, Click "Play" to watch AVI video on iPhone iPad. Here we play AVI video which is not supported by portable devices, it will convert the video on the fly automatically, no need to wait before watching. Overall, this streaming video to iPhone software is a pretty polished app for quickly streaming AVI video to iPhone iPad or iPod. It also supports almost all video formats such as stream MKV HD videos to iPhone/iPad and other formats like MPEG, WMV, MP4, FLV, MOV, MKV, M2TS, TS, etc. This article will present you a best solution to play WMV on iPhone iPad and stream AVI to iPhone iPad, MPEG to iPhone iPad so you do not need to wait for formats conversion or sync, just try streaming video to iPhone iPad. Air Playit is a free video streaming app for Android phone which is capable of streaming AVI video to Android phone over WiFi, 3G and 4G network. So users can remotely watch AVI in Android without conversion and space taking. Just imagine, all of your videos are stored on your Mac or PC at home, and you access them via an app on your iPhone iPad. And instantly the capacity of your iPhone iPad becomes infinite. How to realize it? Here is your answer.